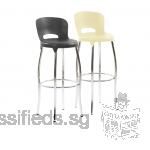 Good quality Bar Chair (1 Unit), Yanna brand, Cream Colour, 1 year old only (photo as attached) selling cheap & must go by 1st week Oct. Interested, plse call me on my HP OR write me an email for further discussion. - 484 black wire - Colour: blue - Stock available: 1 - Measurement: 3m*3m - Ideal choice for outdoor and night events. Bed Frame, Lounge Chair, 3 Tables - Only for 100 - SuperHot! BLACK MARBLE / STEEL SIDE TABLE -Free Delivery! Natural black with beautiful white contrast marble top, brushed steel stand & black marble base. One corner has sustained some minor dents & are shown on the images here. Square marble top 35 x 35 x H 46 cm. WApps now for fast deal with free delivery! Super high quality bookshelves for sale. Solid timber beautifully finished. Bookshelves bought $699 AUD each, selling $200 SGD each. Super high quality looks brand new solid timber anyone who views will surely buy. Beige colour, comfortable, adjustable head rest, timber footrest. Width 2.3m, chaise depth 1.6m, recliner depth 0.9m extends to 1.6m Asking $600 neg, collection East Coast area, separates to 2 pieces.